On September 24, 2009, 5:30-7pm, if you’re in D.C. and want to taste some great cheeses from Zingerman’s Creamery, and pick up a copy of Zingerman’s Guide to Better Bacon, have it signed, and chat with Ari, head to Cowgirl Creamery, 919 F Street NW, Penn Quarter, Washington DC. Tel: 202.393.6880. The event at Neal’s Yard Dairy is still being worked out, but likely mid-November. December will see Ari in Chapel Hill, at Lantern Hill restaurant for a Bacon Dinner on December 8, and at 3 Cups on December 9 for a Bacon and Sparkling Wine pairing event! And on Thursday, December 10, a lunchtime book signing at Southern Season. On Saturday, January 16, 2010 Ari will be at Omnivore Books in San Francisco, time still to be confirmed. If you’re near any of the events, please stop in and say hello! Pull from five foods, Newsletters. Does this go below the line? Planning the marketing – who’s the book for? And how will they find it – from us? From a store? When done at Z house no food will go to waste! Decisions, decisions – what price, size, and shape? Crucial elements all – once chosen, no escape! Now the work begins, to share them with the world. Ari will be presenting at this year’s Epicurean Classic in St. Joseph, Michigan. At noon on Friday, 8/28/09. Sharing great information and stories about bacon from the book, and no doubt there will be some bacon to taste! Ari will be on a panel called “Local Foods in the World and Global Foods in Michigan”, at noon on Sept 13th at the Kerrytown Book Festival here in Ann Arbor, Michigan. Moderator Jan Longone will lead a discussion with Ari, and with Jane and Michael Stern, authors of the “Roadfood” column, as featured in Gourmet Magazine and on NPR. I used Arkansas Peppered bacon as suggested. I had fresh green onions from the farmer’s market, a 4 year aged Wisconsin cheddar (sorry Vermont), cultured butter, heavy cream. Where I deviated from the recipe though, was in the flour – I used 1.5 cups of all-purpose gluten-free flour, and 1 cup of white rice flour. I’m not an experienced baker so am not so good at the “cut the butter into the flour” thing, but I guess it worked out ok! I did prep all ingredients and put them all the fridge so they would be cold as per instructions. And bashed around in my bowl with two butter knives for a while until it seemed like the butter was in reasonably small pieces in the flour. 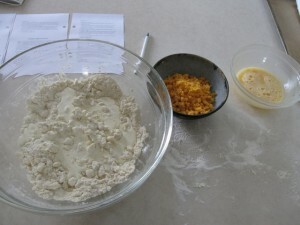 Then I added the other ingredients per instructions, except I added another 1/4 cup of heavy cream – perhaps due to the non-glutinous flour it needed more moisture to hang together. I squeezed the dough to create the two rounds out on the counter. Then quickly cut them into wedges, onto the parchment on baking sheet, drizzled a bit more cream over, and into the oven. Cooked them 23 minutes until they looked brown on the bottom, and let them sit another 10 minutes. Loved these. A little bit crumblier than I’m sure their glutinous counterparts would be, but it still worked great. 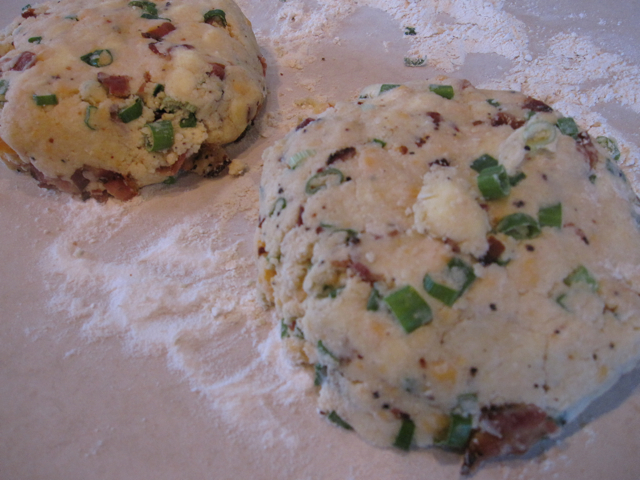 A lovely combo, the cheddar/scallion/peppery bacon. We did not think they needed extra butter, not even my husband who is a big butter fan – these were rich enough without it. We ate four, and decided to risk freezing them to see how they would do. Will report back! Note, we defrosted them in our toaster oven a month later and they were still wonderful. Recipe follows, from page 212 of Zingerman’s Guide to Better Bacon. NOTE, the recipe in the printed book left out the info on when to add the cooked, cooled bacon in to the mix – you add the bacon with the scallions. 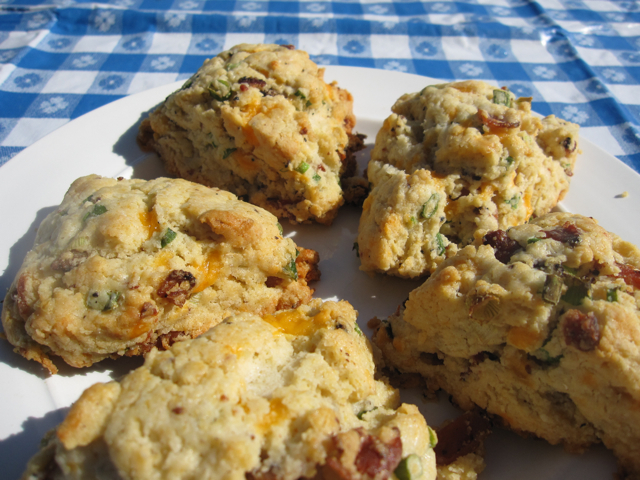 A variation on the cheddar herb scones that we’ve long made at Zingerman’s Bakehouse, these aren’t hard to make and they’re pretty delicious. Paul Saginaw (with whom I started the Deli back in 1982) took home the whole platter of them after we did the first test! I prefer to use cultured butter because it’s got a bigger flavor, and if you want to eat extravagantly you can gild the lily by serving them with room-temperature butter for spreading when they come warm from the oven. Very rich and really, really good. Fry the bacon over medium heat until crisp. Drain, chop and place in refrigerator to cool. 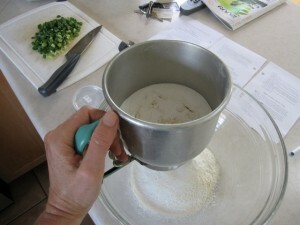 Sift the flour, baking powder and salt into a large mixing bowl. 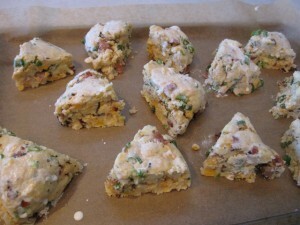 Cut in the butter with a knife or pastry cutter until the mixture forms 1/2-inch pieces. Add the eggs, 1/2 cup of the cream, and cheddar. Mix by hand until just combined. Fold in scallions and cooled bacon. Transfer the dough to a well-floured board. Form two 7-inch rounds. Cut each into 6 wedges. Transfer the wedges to a baking sheet lined with parchment. Brush with the remaining cream and bake for 20 to 25 minutes, until the scones are golden brown on the top and bottom (you’ll have to lift them off the baking sheet a bit to check underneath). Allow to cool and firm up for about 10 minutes before removing from sheet. Serve the same day.